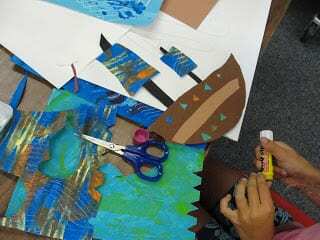 This lesson combines many techniques: drawing, cutting and shaping with paper, painting waves and composition. I chose to do this lesson with an upper grade class but it’s suitable for much younger children as well. 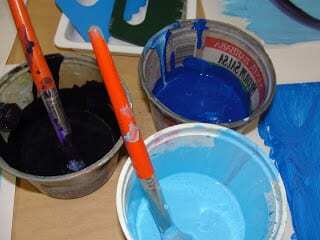 Mix up some tubs of paint and add some large brushes to the tubs. Paint the entire paper with one blue. If you want to have a sunset, add a horizon line and paint above the line orange and below the line blue. Now, add a contrasting color and swirl the two together. 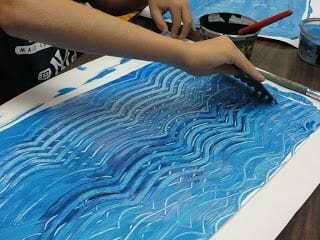 Students can use plastic forks, the backs of their brushes or even their fingers to create waves. Use any technique you would like as long as the entire paper is covered with paint! I drew a few pirate ships on the white board to give the kids an idea of different shaped hulls. Don’t get too fancy here as the idea is to draw a very simple hull with an oil pastel and then cut out. To make it easier for the students, I pre-cut brown pieces of paper (approx 4″ x 6″) and had them draw on that paper. This just makes sure that they don’t draw too large or too small. It seems to work, so give it a try. I also assisted the kids in cutting (with my large trimmer) different sized masts. I mass-produced a big pile and the kids selected two or three. Once the hull is cut out, turn it over to the bad side and glue on the masts. At this point, the ship is free-standing and not glued to the paper. Now start cutting out sails with the smaller pieces of paper. Here’s a tip: cut out a square, trim the bottom to form a curve, trim the two sides to form curves, leave the top uncut. 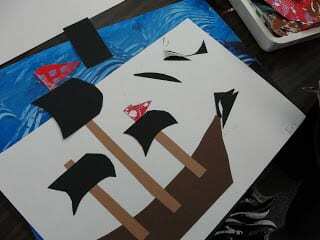 After the sails are added, flip over the pirate ship and glue to background. Putting the ship on a slight angle will give the picture movement. 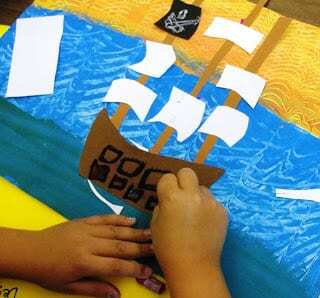 Using oil pastels and scrap paper (if you wish) add details to the sails, fish in the water, decorations on the boat, etc. The kids love this part. Give them a challenge by asking each student to come up with his/her own insignia for their sails. 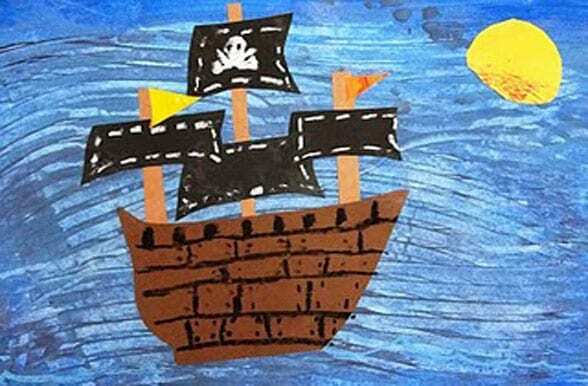 Enjoy this pirate ship art lesson? For another free art resource you can download this lesson on how to draw a ferry boat and we’ll send it to you for free! We linked back to you, with a 5-year old's effort on this project. 🙂 Thanks so much for the wonderful ideas! Well shiver me timbers these boats are brill! 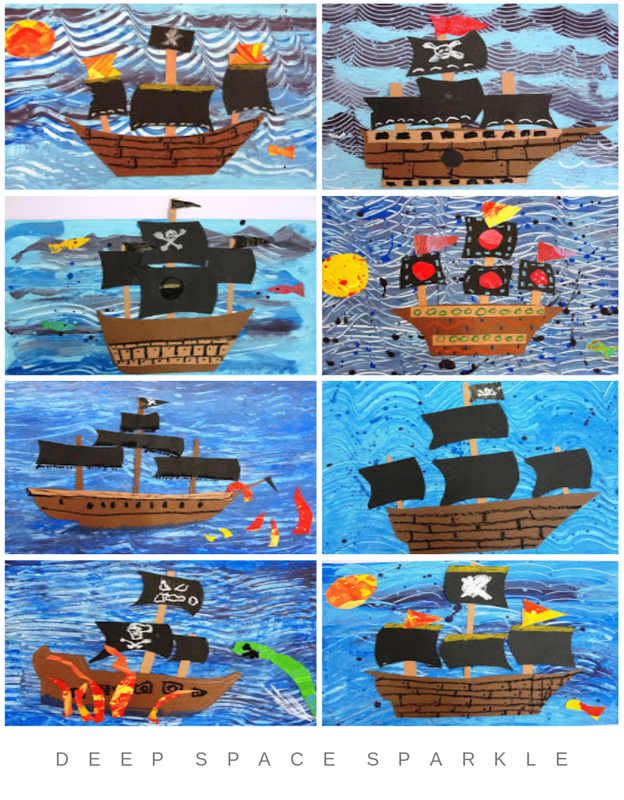 We do a Pirates topic with our 5 and 6 year olds; I think we will give these a try – the way the waves are made is just so clever. Again, thanks for sharing! Your blog is my favourite art tutorial source. Great—since my school are Pirates! I did something real similar to this over the summer with sail boats and they turned out nice, but I absolutely LOVE the pirate ships. 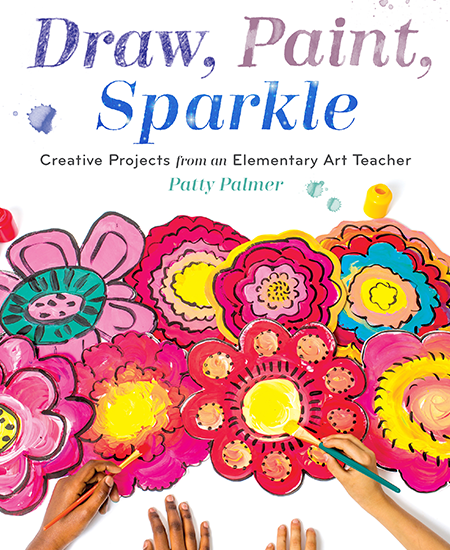 Also, what a great project for a bunch of boys-always looking for art projects that are appealing to them. I’m doing this lesson with my 4th graders next week and I’m curious about what you used the 4×6 white and gray paper for…is that just a varation for the sails? Thanks…our town’s mascot is a pirate, so I know my kids will love this lesson! Yup, you’re right. Just an option for the sails. Funny how all my gallery photos show only black sails! Thanks! This should be really fun for them. I just completed this project with my Kindergarten class. We had so much fun and they turned out great! We are going display them for our “End of the Year” art show! Thank you for all your wonderful ideas!